Kameon Quillen (far left) and Kendra Conley (far right) with student. Photo courtesy of Edmonds Community College. It’s not every day you see a detective sporting pink handcuffs. However, when a Snohomish County detective recently had to choose between pink or black for the day – she chose pink. Homicide detective Kendra Conley donned her pink handcuffs as she spoke to a group of more than 40 girls, grades 8-12, on April 14, 2018, for Law and Justice Day, hosted at Edmonds Community College. 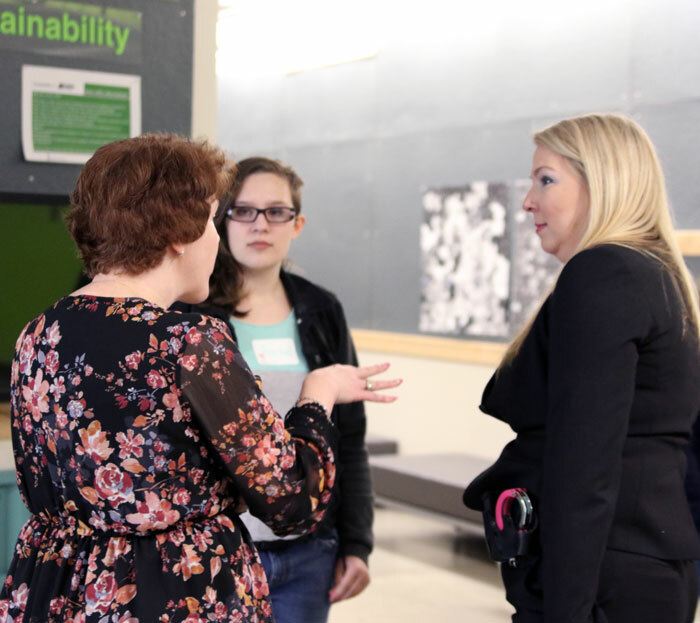 The half-day event, organized by Boys and Girls Club of Snohomish County and InspireHer, focused on career opportunities in legal professions and law enforcement. Girls from around Snohomish County, and even as far as Port Orchard, Wash. attended. “Nationally, women only represent about 14 percent of law enforcement, which is surprising low,” Conley said during a career panel discussion. She’s been in law enforcement for more than 18 years, serving as a patrol officer and then as a detective in the Major Crimes unit. She’s also the only female officer in her unit. Conley was one of seven legal and law enforcement professionals who sat on the panel. Other panelists included: Tom Cox, Washington state criminal defense attorney; Kameon Quillen, victim advocate coordinator for the Snohomish County Prosecutor’s Office; Jennifer Rancourt, Snohomish County Public Defender’s Office attorney; Kaitlyn Dowd, Everett Police Department, Community Outreach and Enforcement Team; and Inci Yarkut, Washington state trooper. The girls also heard presentations about human trafficking by Pastor Scott Mitchell, Peoria Home board member, and teen dating violence by attorney Lacey Offutt, Quillen, and Snohomish County judge Mara Rozzano. “I love that we have this program [InspireHer], so as young girls, we get to hear about women in leadership roles, because that’s something I want to pursue,” said Eleanor Frumkin Marqvardsen, a Lake Stevens High School senior. InspireHer focuses on engaging girls by providing access to career and academic resources, fostering leadership and community involvement, and creating opportunities that develop a strong body and mind. Although she’s unsure about the career path she wants to pursue, Marqvardsen is sure about one thing: She wants to be in a leadership role. If you’re interested in a career in the legal field, Edmonds CC offers a two-year associate degree and certificates in paralegal. To learn more, visit edcc.edu/legal. Law and Justice Day participants. Photo courtesy of Edmonds Community College.